No doubt about it, being a superhero would be pretty cool. Flying, smashing, stretching, web-slinging—all that stuff sounds like a lot of fun. But like everything else, the superhero lifestyle also has its downside. For example, superheroes have no extended family and probably very few friends. Plus, there’s always a wacko supervillain with a not-so-secret vendetta lurking around the corner. “It was the curse of dedicating one’s existence to serving the ravenous gods of justice,” writes Kevin Hosey in a story titled, “Blunt Force Trauma.” Dark knights, WWII super soldiers, and green-skinned behemoths take note. Every protagonist in this short story collection is a card-carrying god of justice. And that means they all have super powers and super complicated lives. Even if they can float in repose on air currents above the city, life is never going to be easy for them. “Going My Own Way,” is about the son of a superhero who rejects his father’s lifestyle to join the fire department. A wife in “The Justice Blues” shuts down her husband’s career and his abusive behavior. Twin sisters unite in “Identity Crisis,” and the sole surviving “Daughter of Nyx” puts herself (and her lover) at risk to lead a civil revolt. 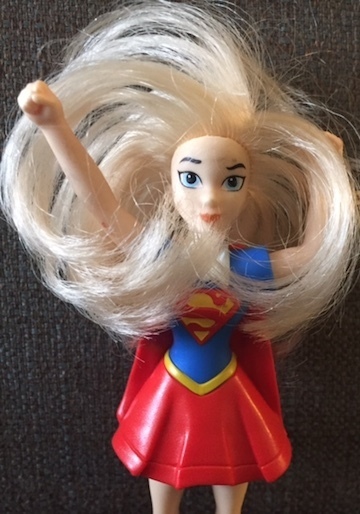 Being a superhero is mostly a serious matter. Even Booster Gold can’t rush into a burning building without a brief moment of reflection, after all. But occasionally a little humor sneaks up on our grim vigilantes. The oddball heroes in Micah Urban’s “The Mass Grave of John Johnsons” will make you smile despite their gross forensic methods. And best of all is “Breaking the Circle” by Derek Tyler Attico. Using multiple realities and lingo similar to Jack Kirby’s fourth world comic books, the author has written a twist-y time-traveling yarn that spirals continuously out of control. 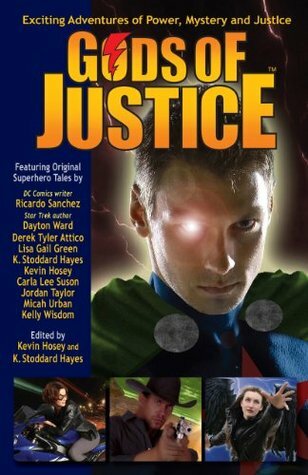 This entry was posted in Published in 2011, Short Story Collections and tagged Gods of Justice, K. Stoddard Hayes, Kevin Hosey. Bookmark the permalink.